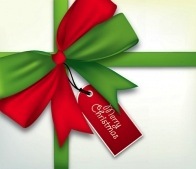 Give an angel this holiday season, one that’s amusing and functional! Definitely not the ordinary angel statue, these wild bird feeders are downright fun. 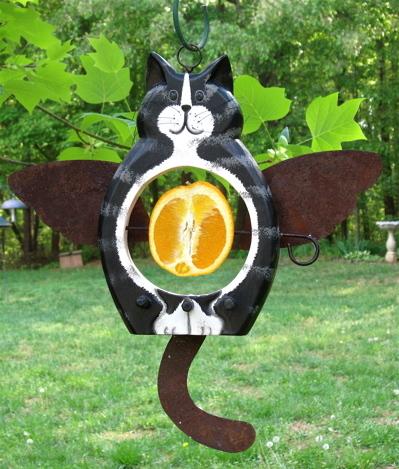 Angel Cats are pin or staked feeders for offering fruit, suet or seed balls. There’s even an orange tabby who’s equally adorable. Rustic wings are adjustable, with three perches on both front and back for bird’s dining comfort, complete with metal loop for easy hanging. It’s perfect for any feline lover and is sure to bring some big smiles… we know the birds will love this one too! 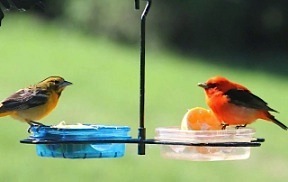 A totally different style for offering birdseed, the other one’s actually dubbed “Garden Angel Bird Feeder”. It’s a great design because unlike tray feeders, the top helps protect seed (and birds) from the elements. Accommodating most seed mixes, you can always opt for peanuts, suet chunks, even fruit in summer for more variety. 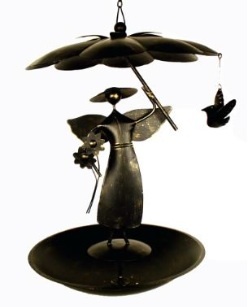 In an antique bronze finish, this whimsical angel will surely delight anyone who feeds birds! The gift of birding is one that gives back, there’s just something about bird watching in your own backyard that takes away the daily chaos of life. It becomes addictive entertainment that’s good for the soul… and good for birds too! Hey lady! What’s up with the Mealworm Feeder? This little plexiglass dish get big traffic in our yard! When live mealworms are placed in it (most times twice a day) all bets are off. The bird traffic is fast and furious, first come, first served! Originally meant for our Bluebirds – the Chickadees and Titmice quickly learned of the treasure. So, the Bluebirds soon received their own enclosed mealworm feeder, although Carolina Wrens have since figured that out as well! Feeding live worms can get expensive when everybody’s in on the coveted treat, and I mean everybody! Even the Robins get a few worms in a glass dish that’s left on the ground. And I can’t stand when the crows get to them first! Unless you have the time and patience to cultivate your own worms, ordering in bulk quantities is easier on the wallet. The worms really aren’t that expensive… it’s the shipping that gets ya! Since they’re live, overnight delivery is required for warmer temperatures. For a few months out of the year (depending on your location) a second-day delivery works fine. This mealworm dish actually has drainage, but many similar styles do not, making them perfect for offering water too. In summer, fresh fruit is a great choice for migratory birds, while suet mixtures & crumbles, and shelled peanuts are good options for cold weather feeding. 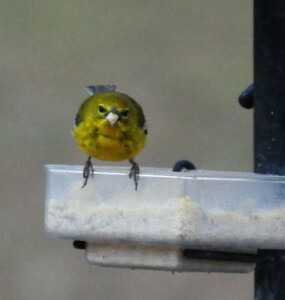 Offering live worms has created a whole new dimension to our backyard birding experiences. Definitely worth giving it a try if you’ve never fed them before, especially if bluebirds are in the area. And Robins adore them too! But if you don’t want the birds eating you out of house and home… a more traditional, or enclosed mealworm feeder may be your better choice. Lots of bluebirds have passed through this mealworm feeder in our back yard. Last season we had three successful broods of Eastern Bluebirds, in part, thanks to a welcoming habitat. Even the Chickadees, Carolina Wrens and Titmice have learned to use this fly-in mealworm feeder with ease… which I’m not sure is such a good thing? Worms are really reserved for our bluebirds only! This traditional type bluebird feeder is made from recycled plastic, and although it’s about five years old now, it still looks and acts the same way as when it was first installed. With so much junk out there, who doesn’t like quality stuff! What I am sure of that’s not a good thing are the yellow jackets who continue to torture the live worms inside the feeder! When, for heaven’s sake is it time for them to die off? Every morning when I go to add worms for the patiently waiting, eager bluebirds… the yellow jackets are in there munching on worm remains. Last night it was in the 20’s here in North Georgia, and finally this morning none of the nasty jax were seen! The weather here is crazy though, hot, cold, warm cold, even some bulbs started forcing their way through the ground with the last dip in temperatures. you put what in the mealworm feeder? We feed lots of mealworms for our Bluebirds, and Titmice, and Nuthatches, and Carolina Wrens, even the Cardinals learned to get in on the game. Because we use several mealworm feeder dishes, and only one enclosed bluebird feeder, it’s pretty much a free-for-all. Buying the worms in bulk greatly reduces the cost of feeding so many worms, and I can honestly say they are a favorite of many birds. It’s so hot and humid, I think my brain may have started to melt today. In the morning, there’s a ritual of starting the day and feeding the pets and the birds. Because fledgelings abound this time of year, we dust the mealworms with calcium carbonate as they are “calcium-depleting” and young birds need strong bones. Today the calcium carbonate almost went in the coffee, while the creamer was headed for the worms! I don’t think the birds would have appreciated coffee mate, and I know the coffee would have been pretty gross. Luckily I caught myself and thought “what the heck?” All was good with the world, or so I thought. Later that afternoon I arrived at FedEx to drop off several packages. Only to find the back of the car empty and the boxes still home by the garage door 🙁 Yes, I believe the heat is actually melting my brain, I’m hoping it doesn’t self-combust! Tomorrow, maybe I’ll start the day under one of the leaf misters for some cooling off. For all the moms out there raising babies on their own… Happy Mothers Day! A Gilbertson nest box was their preference, and soon 5 Bluebird eggs sat in the nest. A pair of Eastern Bluebirds who braved a harsh winter in North Georgia found their perfect nest site. It wasn’t long at all before the eggs hatched and five babies slept comfortably in the pine straw nest. I’m not sure when the eggs were laid, but the next time the box was checked it contained the cutest naked babies. Then some trouble for our Bluebird pair 🙁 Nothing had gotten into the box or killed the babies, it’s dad who had disappeared. With babies fully feathered now and overflowing their nest, dad had been missing for two days, at this crucial fledge time too. The next box check revealed that mom had managed to fledge all five babies, so this gave me hope for at least a partially successfully brood. I supplemented the the worms with calcium carbonate powder to help build strong bones, and doubled the number of worms being offered in the mealworm feeder. 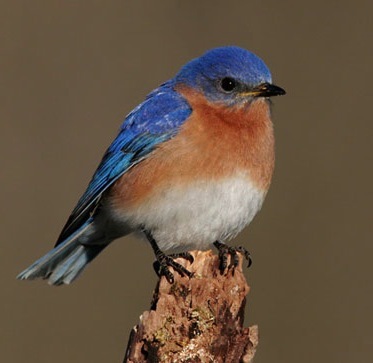 When raising bluebirds, both parents will feed the chicks for thirty days. Even second or third broods receive help from older siblings. Super mom was on her own, and the nasty storms during their first few nights out in the world didn’t help at all. I was like the worrisome mother. Sometimes another mate is found and the new male may or may not help to care for her brood. About two weeks after fledging, a new male was spotted gorging himself at the mealworm feeder. My only hope was that some of the worms were for the babies. Two days ago I spotted one of the babies perched on the pole above the mealworm feeder… yellow mouth wide open and screaming his little head off! It was truly a terrific site and gave me hope that more of the five are thriving. So, in honor of Mother’s Day… here’s to you Mrs. Bluebird! Raising babies on your own out in a tough and cold world, we wish you the best. 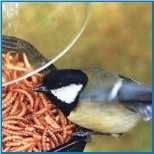 Bluebi rds covet mealworms, in fact, I’ve discovered that lots of birds love these tasty morsels. In trying to attract bluebirds to this North Georgia yard, first came the bluebird house…but no luck. Then came a bluebird feeder, you know, the kind with the entrance holes that supposedly only bluebirds will fly into for food. Unfortunately that didn’t seem to work either, every different “bluebird delight” on the market was used. After some quick research, it seemed live mealworms would do the trick, so I squeamishly ordered the first batch. They weren’t too bad, as long as I didn’t have to touch them! Unpacking and storing that first batch was pretty funny looking back at it now. Newspaper spread on the counter, latex gloves, and a semi-faint heart about the whole thing. Then just knowing I had a container of live worms in the fridge…omg! But I wanted to see bluebirds – so I persevered. Not only did it work, it worked great…Eastern Bluebirds in my yard finally. Two or three showed up at first, and then they began to build a nest in the house. Watching the daily activity was fantastic. A few weeks later the babies started to fledge, one, two, three, four of th em, all following mom and dad. Truly a great season! It didn’t take long for them to figure out how to enter the mealworm feeder and retrieve their own worms at will. The coolest thing is there was a second successful brood that season too. Watching the juveniles with the new fledgelings was absolutely awesome. Now I’m addicted to meal worms just as much as my bluebirds are. Making sure to feed them twice every day, close to the same time. My new friends stuck around all winter, likely due to the three heated birdbaths, and the regular feeding schedule. 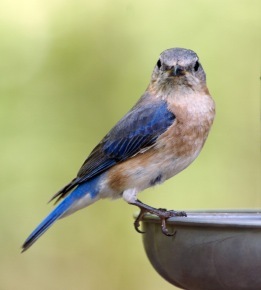 Traditional bluebird feeders aren’t the only way to offer mealworms to feathered friends. 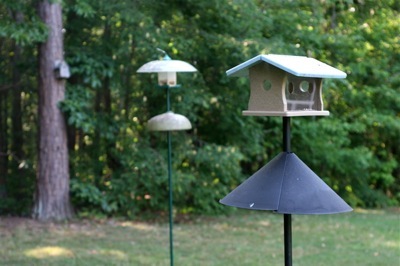 Many dish-type styles have attachments for poles, making it simple to add a mealworm feeder to any existing feeding station. Tray type or platform feeders also have the capacity for worms, but there’s no guarantee the bluebirds will get them first. 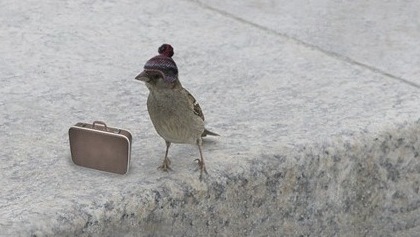 Maybe that’s where the saying “early bird catches the worm” comes from? 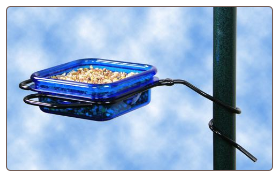 This recycled plastic mealworm feeder easily mounts to any standard one-inch diameter pole. The wooden Siamese Cat has a metal screen tray that’s perfect for offering worms too. 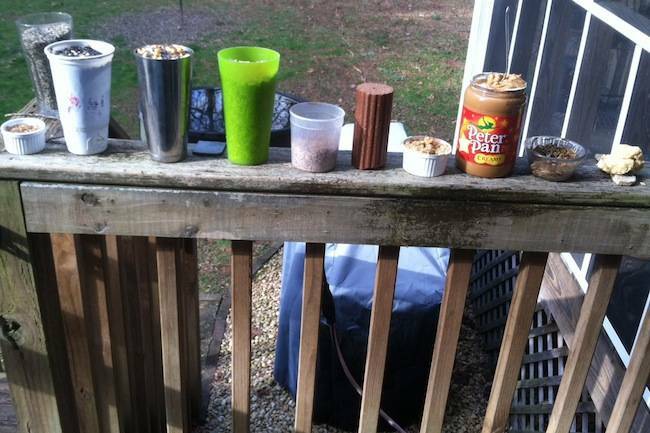 The best part about these types of feeders is versatility. Foods like suet, peanuts and fruit may also be offered, depending on the species you’d like to attract and season.